Cordova is a community in Shelby County, Tennessee, United States. Cordova lies on Memphis' northeast side, north of Germantown, south of Bartlett, and northwest of Collierville at an elevation of 361 feet (110 meters). The majority of Cordova has been annexed by the City of Memphis. The remainder of Cordova is in unincorporated Shelby County, in the Memphis Annexation Reserve area. The boundaries of the Cordova community are inexact, but are generally regarded as the Wolf River on the south, Whitten Road on the west, Interstate 40 on the north, and Pisgah Road on the east. Parts of Shelby Farms are considered part of Cordova. The Old Cordova Area is centered on Macon and Sanga Roads, 3 miles east of Germantown Road. It consists of the former town of Cordova, with some of the original structures still present. The Wolfchase Area is not actually a part of Cordova, but is often referred to as part of the Cordova area by association. It contains major shopping centers, businesses and apartments. Cordova was a farming village east of Memphis with fewer than a dozen farms when it was founded in 1835. Cordova was renowned for the freshly cut flowers that were shipped to Memphis, Tennessee thus the town's motto was "Farms, Flowers and Fellowship". Cordova has changed its name several times. Originally, it was known as Allentown, then Marysville, then Dexter. In 1888 the Dexter post office was opened. In 1900, the name was changed to Cordova. The town most likely changed its name to "Cordova" so not to be confused with another town named Dexter that was located on the same NC&St.L railroad line that ran through town. Cordova was one of the many small railroad stops along the Nashville, Chattanooga and St. Louis Railway route to Memphis, Tennessee. The original station which was built in 1889 is still standing. It is located on the corner of Macon Rd. and B St. in downtown. A train named the Memphian from Nashville to Memphis stopped at the former Cordova Railroad station. (this station is still standing and has been sold to an individual who is renovating it so it can be utilized as a retail business). An important ammunition plant was near Cordova and was served by the railroad during World War II. 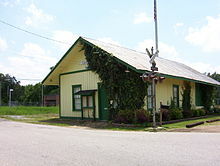 Cordova has a railroad line running parallel to the main street (now Macon Road) that was served by P&M (Paducah & Memphis) division of the N. C. & St. L. Railroad (Nashville, Chattanooga & St Louis) that was chartered in Tennessee on December 11, 1845. In March 1957 NC&StL was taken over by the L & N Railroad (Louisville and Nashville). Because this rail line was considered redundant, the mileage between Cordova and Jackson, Tennessee was abandoned and later scrapped in 1968. The remaining section was therefore made a spur line for the L&N, and later the CSX until 2002, when it was taken out of service. In 2008, this section of railroad was removed. There are plans for it to be replaced by a greenway/trail leading from the county's eastern edge all the way to Midtown Memphis. After a seven-year court challenge to the right of Memphis to annex, portions of Cordova were annexed into the Memphis City Council Second District. 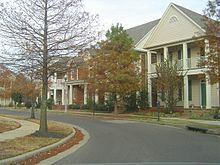 These included the subdivisions and land developments of Countrywood (1995), Berryhill (1997), and South Cordova (2001). After several court and legislative challenges, Memphis completed its annexation of the Cordova region with the subdivision of Rockcreek, along U.S. 64 to the Fayette County line. Cordova grew from a quiet country farm hamlet with a population of 150 people in 1912 to one of the fastest growing neighborhoods of Memphis. Retail growth exploded in the late 1990s thanks to the Wolfchase Galleria shopping mall, which at the time was the largest retail center in Shelby County outside of Memphis city limits. Today the majority of the growth is along Houston Levee Road and Macon Road as well as major retail and commercial centers on Germantown Parkway. There are now over 1,226 businesses with over 19,400 employees working in Cordova. Cordova continues to preserve its past with a historic downtown which each year celebrates with an annual crafts fair and having its own Fourth of July parade. The community is home of the Hope Presbyterian Church, a megachurch with average weekly attendance of over 7,500. In 2005 the church scaled down plans for a $50 million auditorium with a bell tower that would reach to 180 feet after protests from local homeowners, but opened a smaller facility with 5,000 seats in December 2007. In 2010, the area's Heartsong Church gained national attention for opening its doors and welcoming the local Muslim population. The worshipers used this space during the month of Ramadan while the Cordova Islamic Center was being built. There were no protests, contrasting with other areas at the time including the proposed Islamic center in New York, and Mosque in Murfreesboro,Tennessee. Cordova is home to a branch of the Memphis Public Library system. The Cordova Branch Library started in one room at the old train depot on Macon Road before moving to the 1913 community center on Sanga Road. In 2004, the branch moved to its own building on Trinity Road. Bert Ferguson Community Center , located on Trinity Road, is the current site of community athletic fields and rooms, walking trail, banquet hall, and educational development. Businessman Pate Carter, born in Cordova in 1902, founded the Memphis local grocery chain called Easy-Way Store. Actress and singer, Lucy Kate Hale was born in Memphis but grew up in Cordova. Golfer John Daly grew up here. 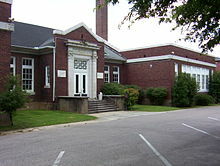 Cordova Community Center (also known as "Cordova School" or "Cordova Elementary School")  is a former school, Shelby county library with meeting rooms, and church. Constructed in 1913 and opening during World War I, it is listed in the National Register of Historic Places. Through fundraising and donations, local citizens purchased the building from the Shelby County Board of Education in October 1985 for $150,000. The building is primarily used to host community events and classes and currently houses the Cordova Museum in a replicate of an old school room. Sports facilities include a gymnasium and ball fields for community athletics. The annual Cordova Festival is held on grounds having last celebrated its 24th anniversary in September 2011. Cordova Station A one room train station for the Nashville Chattanooga and St. Louis railroad in downtown Cordova on Macon Road. Later it served as the Cordova Branch Library of the Memphis-Shelby County Library for more than 50 years until the library was moved to its current modern facilities. Sangie Cemetery Near the corner of Walnut Grove Road (formerly Raleigh-LaGrange Road) and Sanga Road, the cemetery is very old, dating back to the early 19th century. Privately Owned Cemetery. Mid-America Baptist Theological Seminary (MABTS), in Cordova, is accredited by the Commission on Colleges of the Southern Association of Colleges and Schools for associates, bachelors, masters and doctors degrees in Divinity, Christian Education, Missiology, Christian Studies, Pastoral Ministries and Philosophy. As of the 2010 Census, there were 78,138 people, 31,403 households, and 20,760 families living in the 38018 and 38016 zip codes which comprise Cordova. The area includes 33,515 housing units. The racial makeup of the area was 61.5% White, 29.2% African American, 0.29% Native American, 4.99% Asian, 0.065% Pacific Islander, and 2.48% from other races, and 2.1% from two or more races. Hispanic or Latino of any race were 5.47% of the population. Of households in the area, 32.66% had children under the age of 18 living with them, 49.18% were married couples living together, 12.7% had a female householder with no husband present, and 33.89% were non-family households. 27.41% of all households were made up of individuals and 4.95% had someone living alone who was 65 years of age or older. The median age was 34.5 years. The median household income in zip code 38018 was $67,437 and the median income for a family was $82,319. In zip code 38016, the median household income was $64,190 and the median family income was $80,736. The per capita income was $34,806 in 38018 and $32,590 in 38016. About 5% of families and about 6.9% of the total population were below the poverty line, including about 10% of those under age 18 and about 6% of those age 65 and over. Colonial Country Club in Cordova is a private golf club which formerly hosted the Memphis Open golf tournament (now known as the Stanford St. Jude Championship). It received national attention for two occurrences during the 1977 event. First, President Gerald Ford hit a hole in one during the event's Pro-Am. Later, professional golfer Al Geiberger shot a record 59.